Staten Island may be the most suburban of the five New York City suburbs, but it provides a wealth of opportunities for people interested in the arts. It's also widely known as a haven for artists and performers who want to be in close proximity to Manhattan but need more space to live and work in. 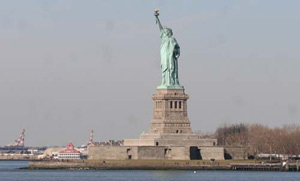 Within close proximity of Brooklyn and Manhattan, Staten Island is a popular place to raise a family. We are the preferred limo company for many of the areas wedding planning businesses, and we would be thrilled to take part in your Staten Island wedding. Brides and grooms prefer us because we make transportation a non-issue on the big day. Let the romance extend into every detail of your big day, from the flowers, to the reception, to the way you get to and from your venues. Whether you're a celebrity, businessperson, or family in Staten Island, New York Limo wants to take part in the events that define your life. Our limo drivers have chauffeured some of today's top performers, but they're equally excited about the opportunity to provide transportation to your wedding. No matter who you are, you'll be treated with white glove service that only New York Limo is known for. The newly renovated St. George Theatre has played host to a myriad of cultural events, and it is one of our most popular Staten Island destinations. Our clients come from the outer boroughs in their finest, and we provide the stress-free, luxurious transportation. As we navigate the streets of Staten Island with ease, you'll have the opportunity to take in some of the area's historic landmarks, like the Historic Richmond Town, Staten Island Zoo, and the National Lighthouse Museum.